The unspeakable, the horror-shadow, lurking in the church? Yesterday I took you for a walk round St Nicholas, Hurst, a jewel amongst churches, filled with mediaeval tracery and Tudor splendour, suffused with warmth and colour form the past and present alike. But amongst it all, amongst that gorgeous creativity stretching back over the centuries, there was a horror, all right. They stay back in the shadows, and wait their time. But as the days draw in he will no longer spend more than half of the day in sunlight or the aquatint of a stained glass window reflection. Soon, he will be back where he is most powerful. 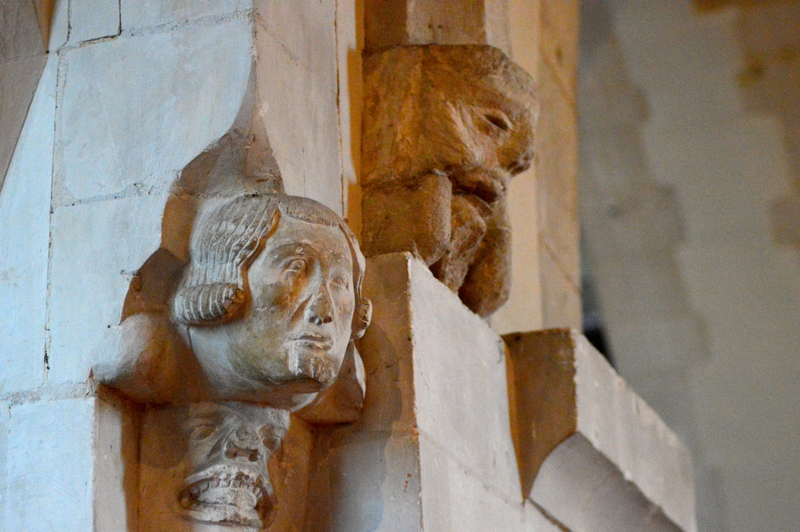 I noticed something strange about the grotesques at St Nicholas. Some of them were in layers. There would be a naive one at the bottom, then something more human, more acceptable. And occasionally there would be another. This one stood out, if you had the antennae to detect him. A creature emerging from the stone and plaster without the need to refine his shape to render himself acceptable to a congregation. One folks don’t always see, because his story might be just a little too potent, or ancient, or evil, for our sensibilities. Is he waiting for All Hallows Eve? The term ‘grotesque’ is a Renaissance one. It did not emerge until it crawls across the pages of a contract for a library: the Piccolomini Library at Siena. Grottesche were part of the Vatican Palace: but the term began to be used for the older creatures which peer out from Mediaeval walls. The grotesque inspires complicated feelings in its beholder. Not just a feeling of the bizarre, but a feeling of empathy. Without empathy, the monstrous simply becomes the monster. And so I have a question for you, as we enter the month of October, when hobgoblins are not unheard of and wraiths gather their own wispy momentum. And it is this: is this particular creature a monster; or a grotesque? Posted in Spine Chillers, UncategorizedTagged art, churches, england, grotesque, Hallowe'en, Haloween, Hurst, spooky, St NicholasBookmark the permalink. It is neither….just an interesting art creation…perhaps representing the good and bad within our own selves . If it is, Karmami, it is most unsettlingly effective! Every grotesque should have someone to love it, Karmami 🙂 Have you read Kathy’s comment? A poem about a grotesque. Just also read some of the other comments and without wanting to be too critical …I must say…that without a doubt we are becoming a very superficial society ! Not exactly gargoyles, perhaps, but close enough to justify quoting from a poem about empathy? “‘God bless the rain, and the stormclouds that bring it. This is incredible. And from the author of Captain Underpants, too. We learn new things every day! I think you are definitely right there, Sidey. There seems to be a leaf shape on his cheek. 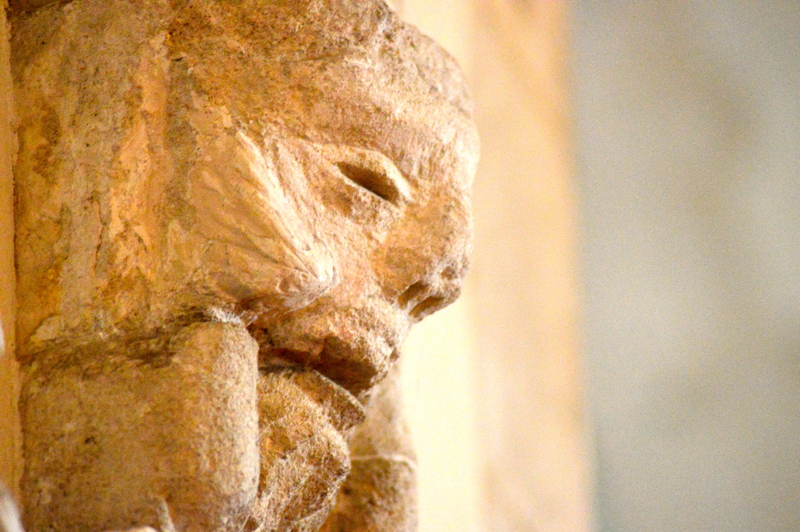 Could this be an image of the pagan Green Man in the womb of Mother Church? A whiff of pantheism drifting out through the ancient stone. He could, Roger, that’s a really good point. The very early churches had so much of the the pre-Christian beliefs as their foundations. Maybe he is part of that. I think so, Jim. Elemental. Agree with ginger. Looks like a horrified soul in rigor (rigour). I suppose that makes it a grotesque. What an amazing way to describe it, Jamie. There is something suppressed about this creature. And it does elicit a kind of empathy. I say it is a grotesque. What horrors, I wonder, or sins brought him to look this way. I’d love to know what brought him to be part of the wall in a little church in the Shires, Penny. He looks like a very, very old person near death. Or, oddly, the face of a very old Galapagos tortoise reaching out for a lettuce leaf. What really made me do a double take was that “thing” right below the head of the normal-looking man just to the side of the turtle/death mask. It’s not even a fully formed face, just a wide-open mouth with teeth showing forcing its way from the corner. Scary. I never even considered that one, Gale! It has its horrors, I agree. Standing next to them in a deserted church, far from other humans, it was the top one which made me consider walking out quickly. Nor me, Carrie 🙂 Hows things? Second book finished yet? It’s finished except for some final edits. Thank you. 🙂 I’m waiting to hear back from early readers, and in the meantime, I’m in the reading-out-loud editing phase. It’s amazing what you notice when reading the manuscript out loud. Great way to find word repetition. There’s a bit of Gollum about him . . . sans the buggy eyes. Oh! Awful… And compelling. So much malevolence but a fair bit of suffering, too. Under what you mean about empathy. The beginning of a story, Cameron, without a shadow of a doubt. Eek. There are times when My to-do list is deplorably ineffective. Off to Outlook. Is it intended to be grotesque or just primitive. I suppose if I better understood the purpose, maybe that would tell me. He’s a very compelling little guy. I think he has something to say and I’m glad you rescued him from the shadows! I’ve never understood the purpose of the grotesque as a church adornment. Have you been to the Duomo in Milan, Kate? It’s positively crawling with the critters. Utterly fascinating. Looks a bit like a tortoise, actually. Yes, grotesque. I love the notion that it inspires empathy. My questions are: What compelled the church to have these grotesques become a part of their interior and exterior? In medieval times, maybe they were intended to might terrify the faithful. Into hurrying into the church to atone for their sins? Well, if you’re already in the church, is more hell fire and brimstone really needed … other than the minister/priest’s sermon? Somewhere I’ve a book called Sermons in Stone which makes this very same suggestion, Judy — a warning against the Seven Deadly Sins and more! Just imagine them all realistically painted up and looking out of the flickering shadows thrown up by guttering candles! Some years ago we visited some of the ruins of Nero’s palace, the Domus Aurea, in Rome (so easy to OD on culture in Rome!). These were only re-discovered in Renaissance times by excavation — the debris of ages having since covered them — and the frescoes of creatures on the walls and ceilings still retained their colour and detail. Being found underground, in a grotto as it were, copies of these images acquired the name of ‘grotesque’ or images in the style of these Roman cave paintings even though they were originally above ground. The fashion for making similar images in the same spindly style spread all around Europe, right into the 17th century. I’ve recently seen paintings and wood carvings in this style on ceilings at Audley End and as far west as St David’s. As far as I can work out the term then was applied to anything weird or fanciful, even inhuman, whether or not it dated from the Renaissance period or earlier. In the 20th-century it got shortened to ‘grotty’ (I think the Beatles made this usage popular) and referred to anything shoddy or sordid. A shame, as the original grotesques were often beautiful! As for your original question: what is it? Looks to me like a very worn so-called Green Man, with vegetation growing out of the side of its mouth. But I won’t take up any more space about the function of these medieval stone heads — much better minds than mine have debated it and come to varied conclusions. Perhaps I’ll get round to reviewing one or two of the studies that have impressed me!